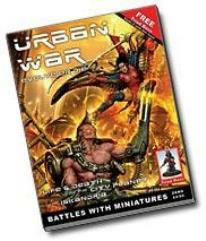 #0 "Setting Up the Battlefield, The Forces on Iskandria, Special Rules"
Urban War is a bi-monthly, sci-fi skirmish game set in the Void 1.1 Universe. Players build small teams of soldiers to fight in the war torn city-planet of Iskandria. Every issue introduces new troops for each of the factions: Viridians, Junkers, VASA, and Syntha as the war on Iskandria unfolds. The individual model and experienced based system allows you to develop your teams to suit your strategies and tactics. They’ve marked this issue "ZERO" because this is the basic game system, further issues will develop the game and the world. The next issues will be more magazine-like in their content. They will of course have new rules and bring in new troop types but they will focus heavily on the support side of the game with scenarios, painting and modeling guides and a lot more fiction.